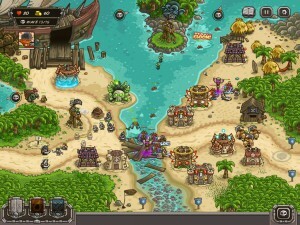 Kingdom Rush Frontiers is a great strategy game for mobile devices, available for iOS and Android. 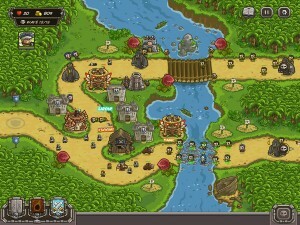 It has been developed by Ironhide Games Studio and is part of the subgenre “tower defense “. This genre is characterized by using strategically placed towers located on a map to stop the enemies. Once the game starts, we begin to build defensive towers to block the passage of the enemy. We can choose between barracks, archer towers, mages guilds and artilleries. In the barracks, three men of arms appear on the road and try to stop the enemy. The archers shoot arrows from their tower. They are not very harmful but they are very fast, so it’s a good choice when dealing with weak and rapid enemies. Mages do far more damage from their towers; although they are not as fast casting spells as the archers shooting their arrows. Finally, artillery towers have guns that attack an area. They are ideal for large groups of not very strong enemies. When the towers are installed, we can improve them with all kinds of advanced armies, like Crossbow Forts, Mighty Templars, Necromancers, and even Earthquake Machines. The only limitation is the money we have. With every victory we obtain stars, which can be exchanged by upgrades. The latest version includes improvements in 8 towers, to be added to the 18 that already had special abilities. The enemies are also varied, with over 40 unique skills. The game has three levels of difficulty, casual, normal and veteran. It also has three different game modes: Campaign (in which all options are available for defense) Heroic Challenge (with partially limited options) or Iron Challenge (with options further reduced defense). You can buy Kingdom Rush Frontiers for $1.20 for iOS users, $3 for Android and $3.68 for the high-definition version for the iPad. Besides, there are several extras that can be purchased separately, as more powerful heroes or packages of gems that will help us to advance more easily through the game.